He was born in Smolensk city of Russia on the 8th of May, 1955.Mikhayil continued his education in Vocational school # 19 after finishing secondary school # 4 in Smolensk city. He started to work as a tractor driver in Smolensk Union of Agricultural Equipment in1971. He was called for military service in 1975 and served in Baki Military Unit 6500. After he was demobilized from the Army in 1977, he was sent to Tbilisi School of Master Officers. Slesarov returned back to Baki when he finished the School of Officers in Tbilisi. He first worked as a Master Officer, then Infantry Unit Commander (1981 – 1986) and a Chief of Security Platoon from 1986 to the January of 1999. Mihkayil Slesarov was on duty on the 7th of January, 1999 in Gobustan prison when a group of prisoners tried to escape by disarming several security wardens of the prison. And Mikhayil immediately established a defense group in order to prevent the incident. The operation went very well and the rebellion was silenced but unfortunately two people died during the operation. But if the incident had not been prevented in time, there would have been even more human loss. 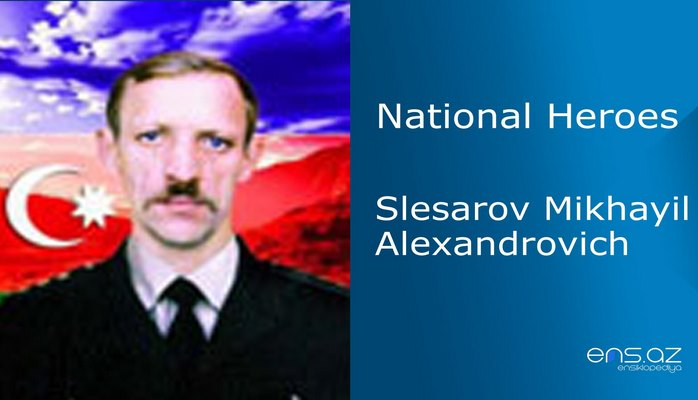 M. Slesarov was promoted to the rank of lieutenant in 1999. He was a platoon commander of the Military Unit 6500 within the Ministry of Justice of Azerbaijani Republic in Baki city. Slesarov Mikhayil Alexandrovich was awarded the title of the “National Hero of Azerbaijan” by the decree 73 of the president of Azerbaijani republic on the 12th of January, 1999. S. Mikhayil passed away on the 12th of April, 2014.